Working remotely allows us to be always on the move, visiting new destinations and exploring new places. One of the reasons we do this is to get inspired by our surroundings and to create adventure every day we work. We strive to take the office out of the mundane and into a place of creativity with a purpose. Our next location is Chiang Mai, Thailand. We know that Chiang Mai is one of the best locations for digital domads. Thousands of nomads who run diverse online businesses keep coming back to Chiang Mai because of the active nomadic community, stellar WiFi speed, and affordable accommodations. But what else is there to do when you’re not being productive in a great coworking space? What else makes this cultural sanctuary so inspiring? Chiang Mai is known as the "Rose of the North." It is a city enclosed by ancient walls and a moat. It was once the capital of the Lanna Kingdom and is referred to as the capital of the north. It is a magical meld of new modern amenities and historical treasures of art, architecture, and history. Temples fill the city. Galleries and shops in homes line the sidewalks as you peruse your way through the streets. So what will we do when we visit Chiang Mai, and we have a few hours to explore? We will fill it with nature, history, peacefulness, and exploration. Since Chiang Mai sits in a valley encompassed by Thailand’s highest mountain ranges and there are over 50 national parks in the area, so we plan to do some hiking. The “roof of Thailand, or Doi Inthanon National Park, is part of the Himalayan mountain range and boasts elevation ranges between 800 and 2565 meters; the highest is Doi Inthanon. There is camping, hiking, a nature reserve, and waterfalls. 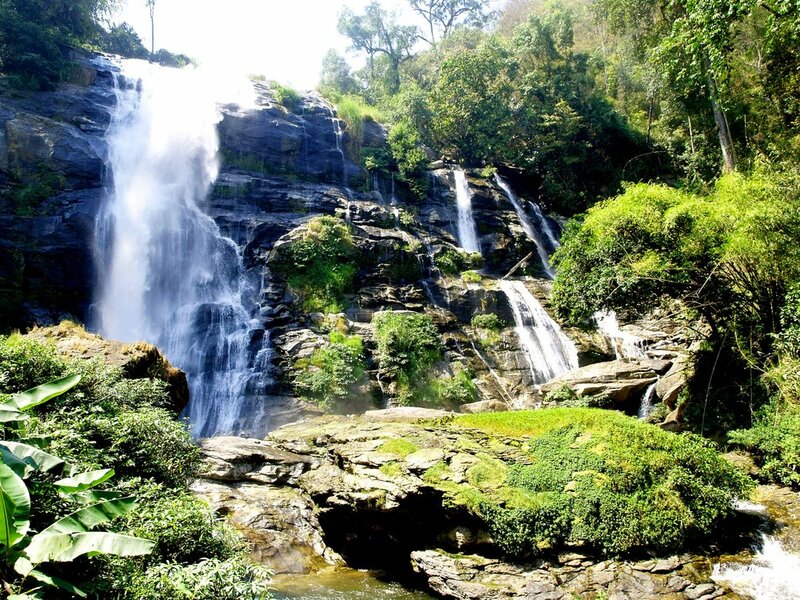 The must-see falls Mae Sa Waterfall which is eight ten small waterfalls that intersect between 100 meters to 500 meters apart. There is a roundabout route to hike up and around for the perfect day exploration. We can’t wait to hike a mountain in the Himalayas. Perhaps this will be a stepping stone to bigger hikes. If religious architecture is your thing, you won’t be disappointed. Buddhist temples are everywhere, and this modern city holds tight to its ancient spirit. It’s not unlikely to see monks travel with blessings throughout the streets in the morning with blessings for the day. Wat Phra Phutthabat Si Roi is the is the place where pilgrims found Buddha's footprints. They were healed immediately from their illnesses when they discovered them and built a temple highly adorned with gold around them. We will visit many temples and explore rural areas but this is a must see. As we think more about our purpose in travel and how we can do good to the places we visit we want to look at ways cultures have sustainably used their resources. Who doesn’t love elephants? 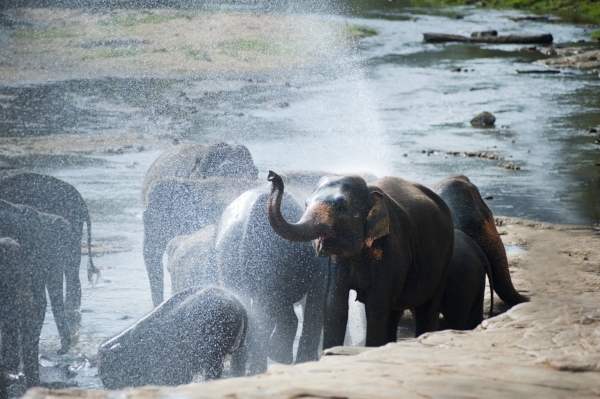 Our trip includes a visit to an ethical Elephant Sanctuary where we can feed, play, and learn about these majestic creatures, but if you’re not squeamish, you could also learn everything you can do with the elephant poo at Elephant Poopoopaper Park. An eco-friendly, naturally built, outdoor museum that educates you in the steps of making paper products from elephant poop. Visitors are invited to help make the paper while on a tour. We hope you will join us in exploring this vivacious city. Our coworking retreat to Chiang Mai is April 7-May 5, 2018, with two and four week options available! Even if you’ve visited Chiang Mai before, now is your chance to experience it on a whole new level with our inspiring community of freelancers, entrepreneurs, and creatives. You’ll have everything you need for an action-packed and productive month. All you have to do is sign up. Questions? Email us! We're here to help. © 2017 PACK. Adventures Ltd.